Under pressure to uphold the �zero tolerance to corruption� slogan of his government, Punjab Chief Minister Parkash Singh Badal today accepted the resignation of Animal Husbandry Minister Gulzar Singh Ranike. The resignation has been forwarded to Governor Shivraj Patil for immediate acceptance. The Trinamool Congress, a key UPA ally, is keeping Congress political managers guessing in what shape her threat of a �firm step� will materialise in the event of the government not rolling back the hike in diesel price and FDI in multi-brand retail. The US has advised its nationals to avoid travel to Jammu and Kashmir after some religious leaders asked American citizens to leave the state to avoid public wrath in the wake of video clips on the web disparaging Prophet Mohammed. People protest against the �anti-Islam� film in Srinagar. The Government has asked the Ministry of Home Affairs to lead a group of ministries in forming a policy to prevent misuse of the Internet and social media. A cyber surveillance agency will be set up to forewarn the Government about malicious content. 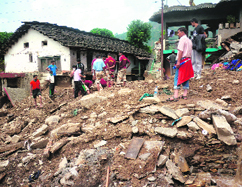 Nine persons were killed in a fresh cloudburst at Uttarakhand�s Rudraprayag district on Sunday morning. The Indian Meteorological Department (IMD) appears to have got its forecast wrong for monsoon, yet again. In August, the weatherman predicted that it would be a poor show on the rain front in September due to the El Nino effect.